Listen to TD1 Radio, a Scottish Borders based station, that's rapidly approaching it's 10th year from intially starting up as an Internet-only radio station. 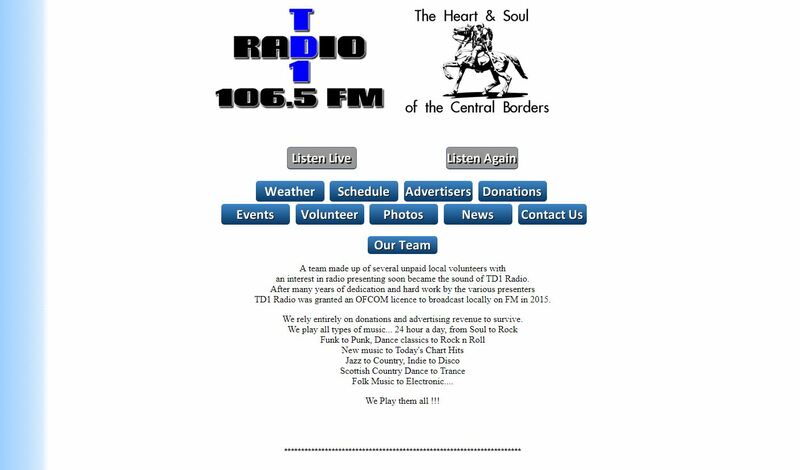 The station, and it's website, provides community information for the Central borders for both individuals and groups. The radio presenters are all unpaid volunteers with a love of music. The team present a range of musical tastes from traditional to country music. There's also Ultimate Gold including hits from 50's to 80's with Iain and 70's music with Diane and Karin. Find out more about the team and the radio schedule over on the website.